Every find a style of writing really annoying, although you like the content itself? Well apparently, Eric Richardson has built a way to remix a site to be less annoying. ...The only way that night could possibly be any better is if someone said the words "and a very special surprise appearance by Olivia Newton John." We know it's not likely. But the way things are going here, we wouldn't rule anything out. ...The only way that night could possibly be any better is if someone said the words "and a very special surprise appearance by Olivia Newton John." I know it's not likely. But the way things are going here, I wouldn't rule anything out. Ah, that's better, individual voice. Of course, this hack wouldn't be possible without Creative Commons licensing. I wonder how large media organizations would react to such remix, or the Gothamist for that matter. The key is that a wiki's brainstorm-point form-reform model is open to everyone in your company. Because it is accessible to everyone, it allows you to tap into the full collective intelligence of your entire company. Because you can reform and condense that intelligence down into knowledge and decisions, it helps push the whole organization forward just like in The Wisdom of Crowds, rather than just small parts of it. And the best part is that it doesn't overload manager's heads because everyone can do it. It's so easy. But when I read about this, I instantly recognized a core problem with the approach: it was top down community, rather than bottom up. Michael Kinsley, who created the site for the Times, was attempting to force a considered, editorial structure onto a set of readers who had yet to identify themselves or their own interests in any kind of structured way. It was doomed to fail, because communities can't be created by editorial structures - editorial structures must be created by communities. ...It's one thing for the LA Times to kill the trolls - that feels like censorship. It's another for the community itself to do it. The traditional editorial structure that we call journalism was created by a community, of journalists. Part of the problem all along is that readers were not part of this community. As new communities are formed and old ones evolve with social media, not only do editorial structures need to emerge from the bottom up, but the social contracts that bind the top and bottom. Another prime example of how the LA Times needs to evolve it's editorial structure is that the open letter to the editors goes unrecognized and unpublished. But that's okay, the community will find a home elsewhere. Coolhunter tells the story in Estonian how the biggest blogger in a small country, Kaur Kender, an accomplished writer, stopped blogging [via Mul on Savi]. Apparently the leading newspaper, Õhtuleht, published a post of his without compensation or attribution. Not cool, or legal from my understanding of the Estonian rule of law. I used to write a translated opinion column for Õhtuleht and am shocked at the ignorance this report implies. The funny thing is that in the Silicon Valley, our way to fix it isn't institutional. If the article was attributed under Creative Commons licensing, the economics would favor the author. So, we would work on helping the creative talent understand what's in their interest and help them assert the rights of copyleft. Everywhere else except save China, we would apply institutional pressure to the offending party. I'd be interested in more facts about this incident. A young and freer press seems to have it's development stunted. When my wife had a bachelorette party to go to, she asked what we should trade. Things aren't so transactional, but I caught her off guard and said she could attend Blogher and start a blog. It's in Estonian, so even I won't get most of it, but it's great thing. Mul on Savi means or "I've got clay," or in slang, "whatever." Me, I'm babysitting during BlogHer. Fair 'nuff. 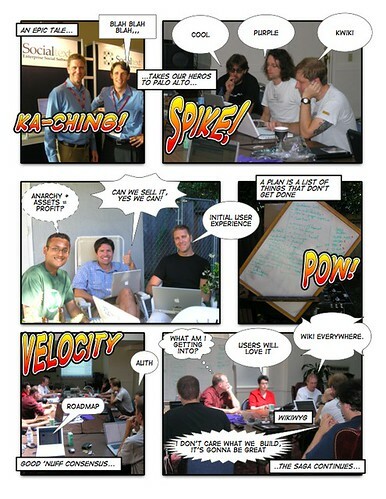 The other week we had the Socialtext team in town... Dave Sifry turned me on to Comic Life -- one of the most fun Mac Apps ever. You too can create a comic book with drag and drop goodness. Look how others are using it. Corporations still need "home pages" to provide a shared set of starting points and departure paths. But the portal isn't the tool that publishes the content or manages the data aggregation. The publishing and subscription processes are being radically decentralized by the use of wikis, weblogs and RSS. I'd add that Portals simply suffer from feedback deficit disorder (FDD). One of the hardest things about change is that it often involves good people. We're keeping most of Socialtext as a distributed company, but as Socialtext Founders, we committed a while ago to move to the Bay Area when we took the step to get a physical office. I've written before about the rewards and sacrifices of Foundership. Ed Vielmetti, co-founder and VP of customer service, decided recently not to make the move. The change is constructive and Ed will always be a co-founder of Socialtext. In December of 2002 we took a great risk together, all wore a thousand hats, rolled up sleeves and worked against constraints. And I look forward to a long standing friendship. We were enthralled with Vonage as a reliable and cheap VoIP service for our home phone. But after several weeks of non-service because of an error in their OSS and incompetent support, we're making the switch to Skype. Most of our phone bill goes to calls with Estonia. Now we have an Estonian SkypeIn number and voicemail for 30 euros per year. Our friends and family in Estonia can call us for free (Joi did a similar international arbitrage trick with Vonage). SkypeOut is used for calling a handful of people who aren't on the network. Skype numbers are available for Denmark, Estonia, Finland, France, Hong Kong, Poland, Sweden, the UK and US (not in major area codes from a quick glance). When other countries with ethnic diasporas are supported, I'd expect a significant switch because of the allure this arbitrage. Then imagine if they supported multiple SkypeIn numbers, not just for arbitrage, but as a decentralized PBX. Skype is hardly perfect. We use it for Socialtext and it frequently hangs when people are trying to get together for a timed call. But for consumer use with mobile phones as a backup, phone companies are scared for a reason. Advertisers and Publishers point out that Ajax may have a negative impact on ad revenue, but that's just because an Ajax app that feeds heightened interactivity to Adwords hasn't been available yet. Ajax lets us tool developers do cool stuff like click to edit without touching the server. We are designing past the limitations of the browser. On the one hand, Ajax lowers browser switching costs. On the other, it raises switching costs between sites. I run Virtual PC on my Mac solely because I am dependent on websites like Quickbooks that chose Active X and thought IE meant security. I'm sure I will not have to for long. Ajax is a metaphor for the browser wars and scrubbing platforms clean.